One of my most exciting things in the mail this week was a 4imprint Blue Box – this came from an offer a few weeks ago (3000 fans!) on their Facebook (no longer available). 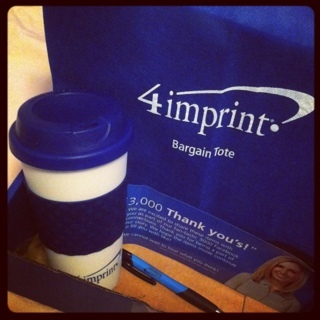 4imprint Blue Box – coffee tumbler, reusable bag and a pen. This entry was posted in mail and tagged mail on February 5, 2012 by Courtnie.